Stéphane Peterhansel (Peugeot 3008DKR n°106) wins his 5th stage on the 2017 Silk Way Rally, on the penultimate leg between Alashan Youqi and Zhongwei. Overall his team mate Cyril Despres (Peugeot 3008DKR n°100), second on the day, extends his lead and looks to be on the verge of his second consecutive Silk Way victory this Saturday in Xi’an. In the truck class, Dmitry Sotnikov (Kamaz-Master n°303), winner of the stage seems to have taken the reins of power over his Kamaz team mates. Tomorrow, before the final podium held in the heart of the ancient capital of the Middle Empire, there remains a short but challenging special of just over 100 kilometres. Sand and dunes as far as the eyes could see. 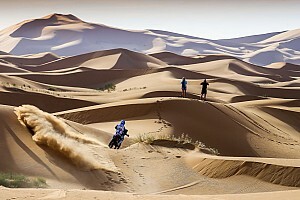 Oasis lying at the bottom of cathedral dunes: the scenery for this 13th and penultimate Silk Way Rally stage was as beautiful as it was demanding, for both men and machines. 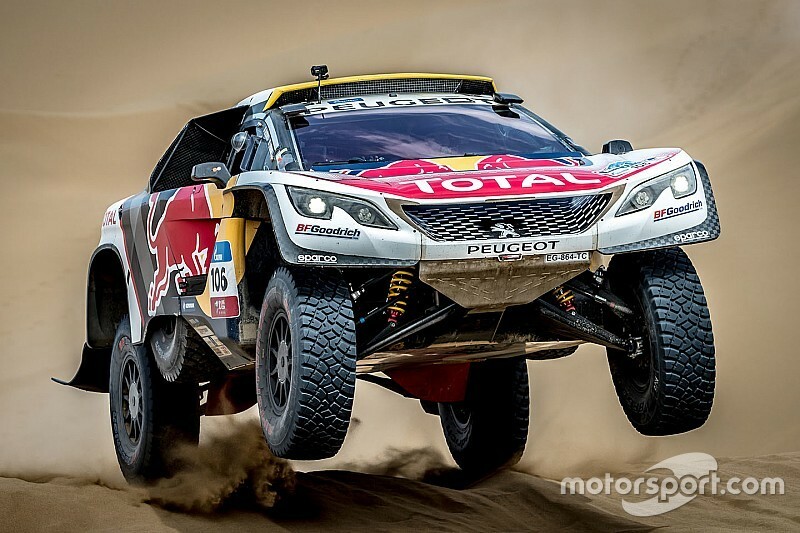 Divided into two distinct timed specials, the stage victory went to the Peugeot 3008DKR n°106 of Stéphane Peterhansel and Jean-Paul Cottret. Continuing their rapid assistance role for their team mates and overall leaders Cyril Despres and David Castera (Peugeot 3008DKR n°100), the winningest duo in the history of the sport take their 5th stage win, whilst at the same time watching over their team mates, who look almost certain to take a second Silk Way Rally win in a row. Second on the stage and comfortable leaders overall, Despres and Castera have only a 100 km special to race before pulling off the feat this Saturday in Xi’an. If their performance was much anticipated, behind them the race was animated to say the least. Fighting it out ‘cat and mouse style’ in the dunes of the Tenger Desert, Christian Lavieille (Baïcmotor n°108), took third place on the day, 19m41s behind the winner and in doing so ‘pinched’ the 2nd place overall from the Chinese driver Han Wei (Geeley SMG Buggy n°107). While it was almost certain this morning that it would be a Kamaz that would take the final victory on the 2017 Silk Way Rally, it was still unclear who would be on the top step of the podium tomorrow in Xi’an. With just a little over 3 minutes in the lead, Dmitry Sotnikov knew that his leadership was threatened by his young team mate Anton Shibalov. Attacking hard, Shibalov actually took the virtual overall lead at the end of the first special by just 2 seconds, but Sotnikov fought back in the second to actually increase his overall lead to 06:04. The last special tomorrow might be short but it isn’t expected to be easy, so while it would be very unwise to declare Sotnikov the winner, after a shaky start earlier in the day, he is looking marginally more comfortable this evening than he was this morning. Mardeev, 3rd on the special, and overall, led in the Belorussians Viazovich (MAZ n°304) and Vasilevski (MAZ n°309) and the Kazakh Ardavicius. Bad day on the other hand for his team mate Gerard De Rooy (Iveco Powerstar n°302), forced to drive to the bivouac at Zhongwei by tarmac, before the start of the second special, after running into steering problems.